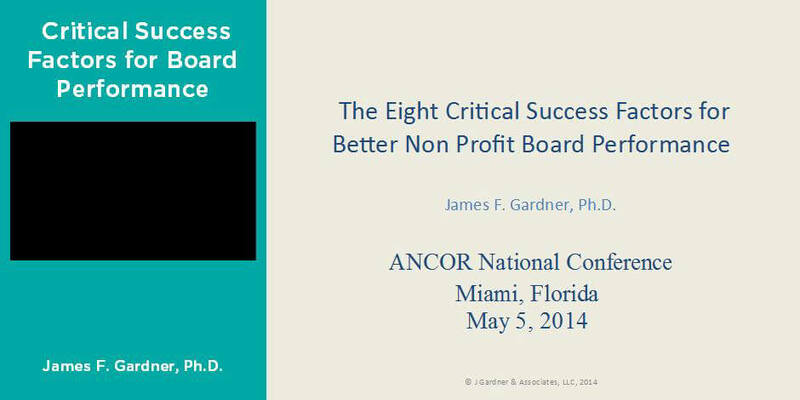 In this video course, James F. Gardner, Ph.D., President and CEO of The Council on Quality and Leadership in Supports for People with Disabilities presents strategies for improving board performance through good board governance and sustainable planning. There are many changes in the nonprofit sector today and the future is unpredictable. A recent survey reported that 67% of nonprofit CEOs anticipate leaving their jobs over the next five years. Boards need to start planning early for these transitions and develop a better understanding of the role of leadership in their organizations. They need to develop new and sustainable business models to respond to current conditions to ensure that their organization’s mission can play an influential role in the future. Understand and apply the models of organizational sustainability. Discuss how a new emphasis on measuring outcomes and networked organization is having an impact on nonprofits and how boards must adapt in response. Identify the role of boards and types of governance. Instructor: James F. Gardner, Ph.D.
James F. Gardner, Ph.D. is currently the President and Chief Executive Officer of The Council on Quality and Leadership in Supports for People with Disabilities. From 1977 to 1986 he served as Director of Community Programs and then as Vice President for Community Program Development at The Kennedy Institute at The Johns Hopkins University. Dr. Gardner received his Ph.D. in a dual program of American Studies and American Social History from Indiana University. He was awarded a Joseph P. Kennedy Jr., Post-Doctoral Fellowship in Medical Ethics at the Harvard Medical School. Dr. Gardner later completed the Masters in Administrative Sciences program at The Johns Hopkins University. Dr. Gardner has held faculty appointments at The Johns Hopkins University and the University of Maryland. He has written and edited numerous publications in the field of human services. Dr. Gardner is a nationally recognized leader in the application of quality improvement methods to the field of human services. Through presentations at national conferences, in his teaching and writing, and during organizational consultations, Dr. Gardner argues that the measurement of quality must move from compliance with organizational process to facilitating person-centered outcomes for people. Dr. Gardner has directed The Council’s research and publication initiative in the area of quality of life design, measurement, and improvement. Since the introduction of The Council’s Personal Outcome Measures in 1993, Dr. Gardner’s research has appeared in Mental Retardation and the International Review of Research in Mental Retardation. Disclosure: James F. Gardner, Ph.D. has declared that no conflict of interest, Relevant Financial Relationship or Relevant Non-Financial Relationship exists.